Technically trained Software engineers generated Sysessential for MSG to NSF Converter utility in the labs of Sysessential for exporting large amount of emails from Outlook MSG files into Lotus Notes NSF file format. Users can access converted emails into Lotus Notes NSF file format after conversion process gets over. The application works smoothly without caring of the specific Lotus Notes version. You can run the application on any Lotus Notes version such as 8.5, 9.0.1 and many more. Complete data migration is for sure. Now, if MSG emails are in bulk, then also application migrates into MBOX file format without affecting any hurdles in the long run. It is user’s choice to make batch conversion or conversion of single emails one by one. Date wise filter option is genuine feature that aims converting emails of specific dates. You need to specify date in the date column in ‘From’ and ‘To’ as this will filter the emails of particular emails. Once you have made the selection, the MSG messages in the particular range lead to import MSG files into .nsf. The folder structure of the software remains unchanged while you move MSG files into MBOX. Software promise for causing no troubles related to folder structure further. The tool is supportive of working on Windows Operating System. Regardless of any specific edition, software provides fruitful results in the long run. Software is equally supportive of keeping folder structure unchanged when moving MSG files into NSF file format. The data will remain unchanged throughout and you will access folders in the same folder structure. Resolve undue conversion troubles as software performs quick to use application. Is it compulsory to have Lotus Notes installed on machine for converting emails into NSF file format? Which OS needed for running Sysessential for MSG to NSG converter? Sysessential for MSG to NSG converter runs on all Windows editions such as 10, 8.1, 8, 7, Vista, XP. Thus, there is no complication whichever version you are using as it supports all the Windows editions. Go ahead with conversion plans via this application. Will conversion affect folder structure? Software retains folder structure and keeps internal structure as it is. You will find utter while accessing MSG files into NSF file. Through this utility, end users acquire same folder hierarchy even after conversion gets over. This application also keeps important email data unchanged and bring no data loss. Is software workable when emails are bulk to export? 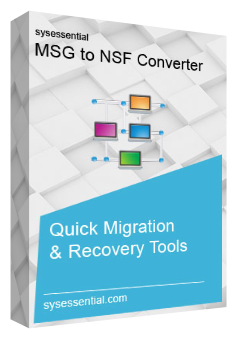 Sysessential for MSG to NSF converter is up to the mark software application which is supportive of converting bulk MSG emails into NSF file format. You can run for N number of emails. Being powerful in nature, software will move bulk emails at one go. Do the software follow any specific file size limit? The application works with all sorts MSG files without caring about specific file size. You can run it in an easy manner even if your MSG files are large in size. Will software affect data integrity? What is the proviso when user come across technical issues? In case of any sort of complications, user can get connected with the support executives and seek the answers to all the queries. Direct phone chat with software developers is also a facility but only when there is acute troubling issue otherwise support team is there for you. There is no specific time to make a phone call, you can call anytime and seek worth answers from support experts. After falling into urgent need of MSG to NSF conversion, I was unable to make out which tool will serve the purpose in the best way. I discussed with one of my colleagues and he suggested me for installing Sysessential for MSG to NSF converter application. This tool exported MSG emails into NSF flawlessly. Features and functions in the tool are impressive and free from errors. I am a professional and know that there is nothing more complicated then converting emails from MSG files into NSF file format. The task was painful when I was doing it manually. However, I wanted to cut down all conversion complexities via professional application. Then I decided for choosing third-party software and chose Sysessential for MSG to NSF Converter tool. This application migrated all the emails and then I became capable of accessing emails clearly into Lotus Notes email ap.